We have covered Messerschmitts on the blog earlier (part I, part II), let's take a look at the other side, more precisely Britain. 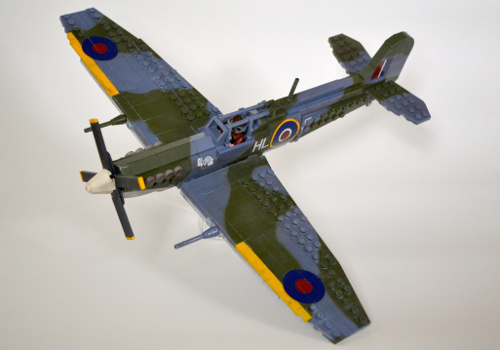 The Supermarine Spitfire is probably the most well known British fighter from World War II. 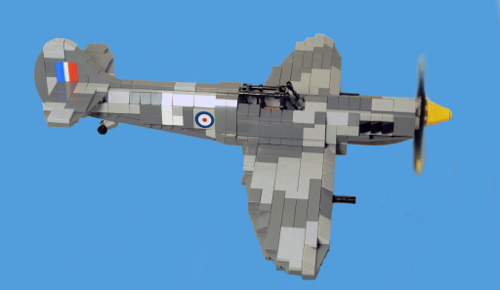 It was a protagonist of the Battle of Britain when the Royal Air Force defended British airspace in spite of being in numeric minority. According to statistics there were more aerial victories by Hurricane pilots, but still somehow the Spitfire emerged as the symbol of victory. It could have been be due to its slightly better performance, or simply because it is somehow more aesthetically pleasing to look at. Hence it is no wonder that numerous LEGO versions have been built over the years. Let's start with the model of Exploded LEGO. This is one of the smallest one I have found on the net. It is less colorful than the others, but still has plenty of interesting details. For example the yellow leading edge of the wings, or the small "flag" on the tail. In spite of its size it even has a retractable retractable landing gear! We have introduced Mattias Martenssonnal (alias eremms) already during the Messerschmitt coverage. 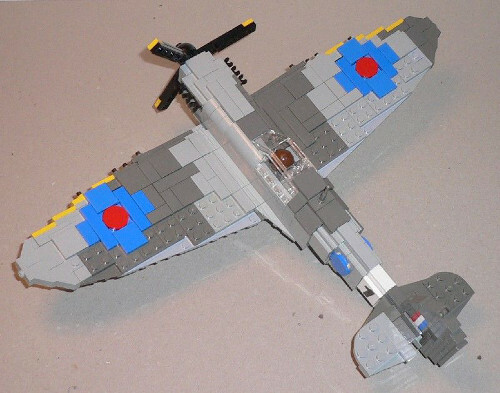 His model is a bit more colorful, light gray and dark gray gives you the characteristic camouflage pattern of Spitfires. Unlike most others, the insignia are built from bricks rather thank stickers. I think it looks really good. Today's last creation is from Lego Monster who should be familiar to our readers already. 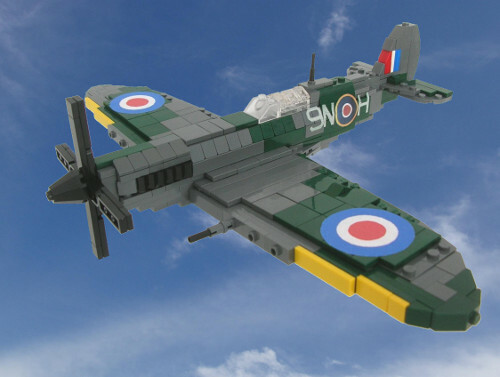 He took his fair share of Spitfire building too. Today we look at the 1:36 scale version that was built a couple of years ago. 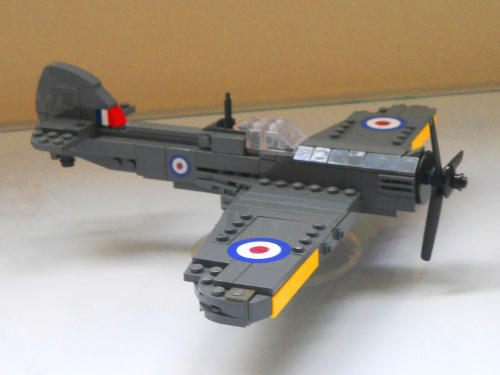 The plane is built from real dark green and dark gray, which looks pretty nice, just like other details: the yellow part of the wing and the flag.